Ummm, well, not exactly. I’m not Alex Jones and don’t put things onto this website that i know to be false, but i did fall victim to some inaccurate information and, worse, perpetuated it in my recent blog posts describing my getting photos of all the bridges over the Sacramento River. Turns out that i don’t, in fact, have them all. I’d DuckDuckGone crosseyed looking for a complete list of crossings of this river, and the only attempt at it i found was this wikipedia List of Crossings of the Sacramento River, which i foolishly at first assumed was authoritative like the stunning List of Crossings of the Willamette River that i’d relied on to do my essay on Portland’s bridges. Unfortunately, the Sacramento River list does not include railroad bridges, which is a shame because they’re often quite interesting structurally even though they range from difficult to impossible to photograph. After i’d done my photography in Redding and discovered the Redding Trestle, i hacked my way into the source code for the list and added a row for the trestle. Then later i discovered that the list omitted the handsome Ribbon Bridge, a pedestrian/bicycle bridge about three miles upstream, so i went ahead and added that to the wikipedia article even though i’d not actually seen it because i’d been relying on that damn link to spot the bridges for me. Still later, it came to my attention that the Sacramento River does not begin at Lake Shasta but rather feeds it, so i’ll have to make another trip up there to get the bridges over the upper reaches of the river. Sigh. So stay tuned. I edited the introduction to the list to clarify that it covered only bridges from the Ribbon Bridge south. If i live long enough i’ll add to the list the bridges north of the Ribbon Bridge and perhaps even the railroad bridges that i’m able to photograph. 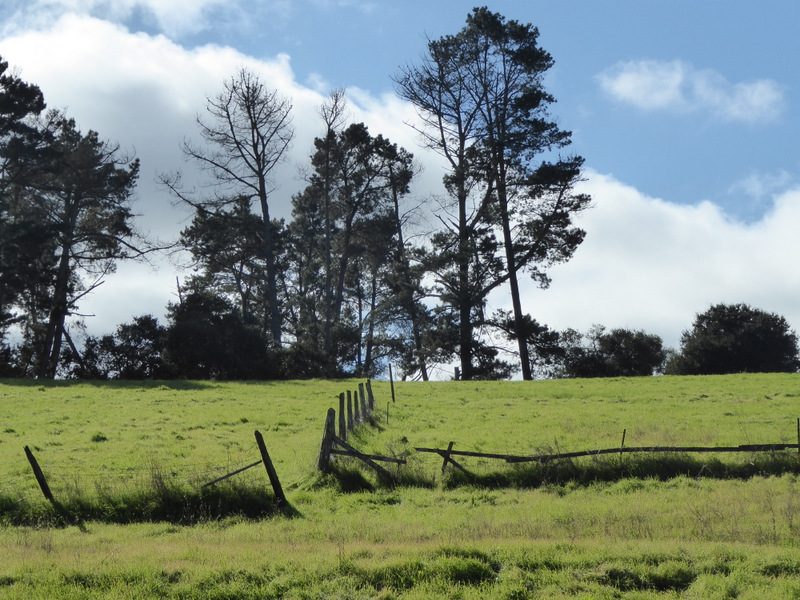 And since i don’t have any more bridge shots now, here’s a pic of one of my favorite fences in a field west of JoAnn’s place, all green from the winter rains. I have to admit that it’s currently my favorite fence, but i like it so much that i’m gonna keep my eye open for more fences.